The lines of desire are set ablaze with this 80s drama about fidelity and the rules of engagement within (and without) a queer relationship. LONDON – After a well-received run at London’s King’s Head Theatre, late British playwright Kevin Elyot’s debut play has received a West End transfer. Coming Clean, which premiered at the Bush Theatre in 1982, was landmark for its time with its normalization of a queer relationship, and its issues of fidelity and desire still relevant today. Directed by Adam Spreadbury-Maher, Coming Clean follows committed couple Tony (Lee Knight) and Greg (Stanton Plummer-Cambridge). In an open relationship, they just have one rule for their external engagements – never sleep with the same man twice. Of course, all this is set to fall apart when gorgeous but unemployed actor Robert (Tom Lambert) comes into their lives. Punning nicely on its title, Robert winds up becoming their cleaner, and things begin to get complicated when both halves of the couple begin to experience intense desires for this young Adonis, leaving their heretofore perfect sexual contract now in jeopardy. Set designer Amanda Mascarenhas and lighting designer Nic Farman have worked well together to create a welcome atmosphere in our main couple’s living room, domestic and homely with its conformity to a distinctly ’80s aesthetic, from Robert’s Walkman to a record player, bringing us right back to the era. This intimate set is key to endearing us to our protagonists, bringing us closer to the drama and tensions that develop onstage, primarily gleaned from the transition of lust to intimacy in the odd love triangle that develops between Robert, Tony and Greg. With its setting in the pre-AIDs scare era of the 80s, the fear of death never rears its ugly head to interrupt Coming Clean’s frank and honest discussion of sleeping with others, getting at the emotional aspects of the phenomena. For anyone who’s ever found themselves in a long term relationship (and god knows refers to anything 6 months and above in this day and age of one night stands), the gripes and catty exchanges between Tony and Greg are familiar ones, sharing inside jokes and knowing glances. It’s all too sweet to see Greg excitedly talking about with Knight and Plummer-Cambridge’s chemistry making it all the more believable. In a secondary plot, the couple’s longtime friend William (Elliot Hadley) offers to cook dinner at the couple’s 5 year anniversary party, only to show up late with a bruised face after being assaulted for being queer. 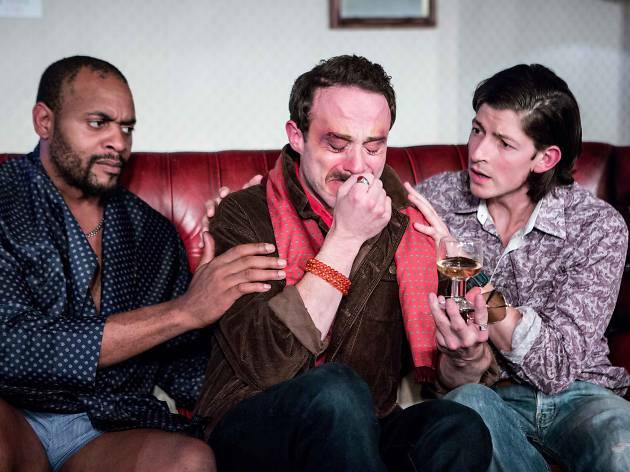 Within the play, this is perhaps the most political it gets, reminding audiences that homophobia continues to be well and alive, an ongoing battle that still has yet to end, one we feel emotionally as the cast breaks down and begins crying hearing William’s recount. Things come to a head when the naked truth is revealed and a passionate, illicit affair with Robert is brought to light. It’s almost devastating to see the once happy couple fall apart so quickly, going from amicable to cold strangers in a matter of moments. At the same time, one completely understands why both Tony and Greg would be tempted by Robert’s natural beauty – youth, after all, is currency in the queer world, and by admiring his beauty, we as the audience are similarly complicit in encouraging such fawning. The pacing with which this unfolds is deliciously arresting, keeping us hanging off every word and scene. To see one half of the couple want to maintain the status quo while the other so brazenly willing to throw it all away is heartwrenching, simply because we know it will never work out. Coming Clean ends with the vestiges of desire, a sense of longing hanging in the air with the couple miles apart, both emotionally and physically. Coming from the highs of a libido you could feel coursing through the entire theatre to the lows of a painful breakup, Coming Clean lays bare the age-old issues of trust , and the importance of communication communication communication. All relationships go through the hardest of tests, and sometimes, the only way to get through them is to be completely honest with one another, lest it leave behind a mess no amount of cleaning is going to be able to save. Coming Clean played till 2nd February 2019 at Trafalgar Studios, London.